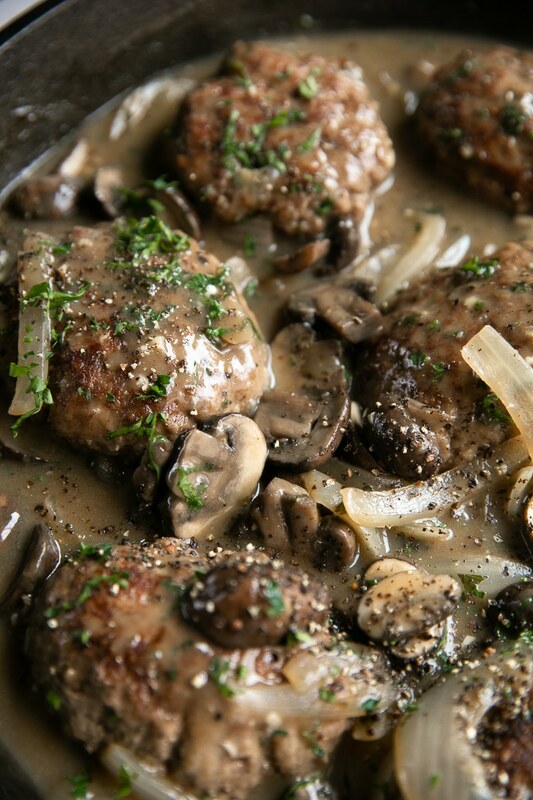 Made with tender, juicy beef patties smothered in a homemade onion and mushroom gravy sauce, Salisbury Steak is a classic comfort meal loved by all ages. 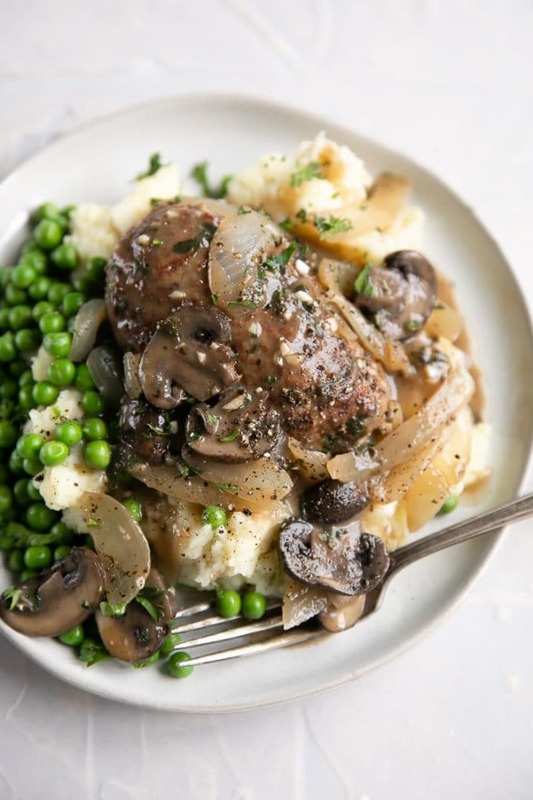 Enjoy this mouthwatering 30 minute Salisbury Steak Recipe with your favorite mashed potato recipe and a scoop of green peas for a complete meal! 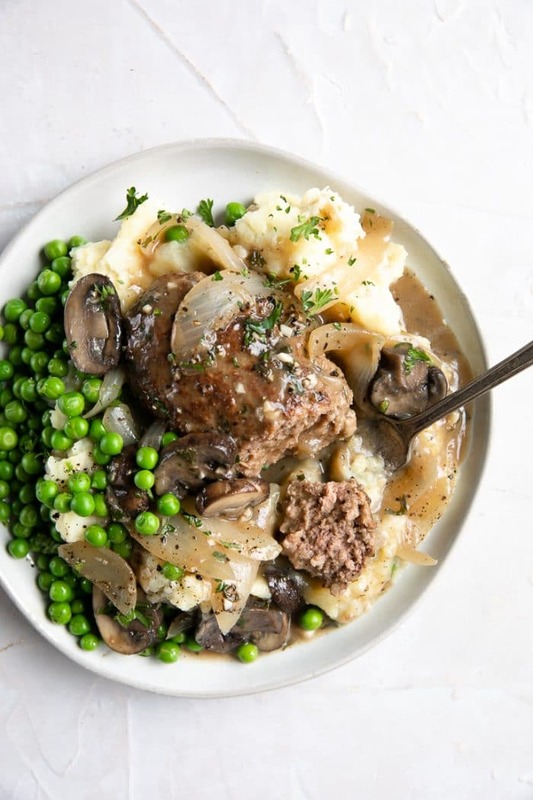 Delicious, comforting, and familiar, Salisbury steak was one of my favorite dinners growing up- and still is whenever I need something extra cozy! Golden brown meat patties smothered in an irresistible homemade onion and mushroom gravy, the whole family loves this classic comfort food. 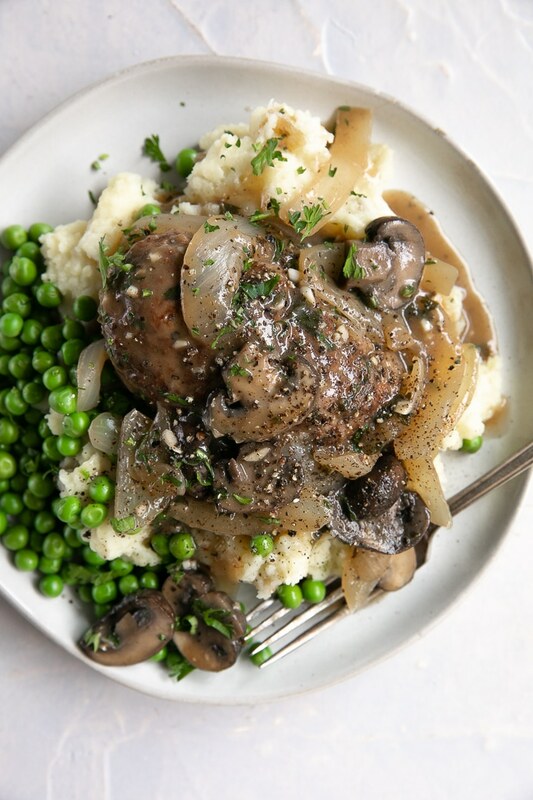 Quick, easy, and perfect for busy weeknights, this Salisbury steak recipe cooks together in one skillet and in just 30 minutes! My family loves to serve this with our favorite Mashed Potatoes and a side of peas. 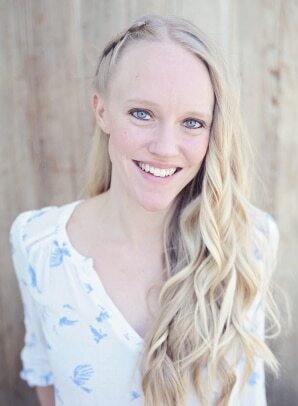 However, other fan favorites also include egg noodles, pasta noodles, roasted carrots or Brussels Sprouts. For lower carb options try serving this recipe with riced or mashed cauliflower. The most simple definition for Salisbury steak is that it is a dish consisting of ground beef and other ingredients typically served with some kind of gravy or brown sauce. The term Salisbury Steak was created by the physician J.H. Salisbury and was introduced in 1888. J.H. Salisbury believed that certain foods, particularly starches, vegetables, and fruit, were the cause of many illnesses and diseases. As such, he created the Salisbury steak, or ground beef flavored with onion and seasoning and then either fried or boiled and served covered with gravy or brown sauce. In this “Salisbury diet” he suggested that people should consume Salisbury steak three times a day with lots of hot water to flush the digestive system. In other words, Mr. Salisbury was one of the very first advocates for a low-carb diet. Although sometimes used interchangeably, there is a difference between these sister beef patties. Hamburger– typically formed into a much more uniform rounded shape and served on a bun, the hamburger steak by USDA labeling standards must only contain beef and minimal spices. If the hamburger contains additional binders (breadcrumbs, etc), it will no longer be considered a “Hamburger” but instead must be labeled as a “beef patty”. Hamburg(er) Steak– much like the hamburger, this round and thick beef patty are made almost entirely from ground beef and simple seasoning. However, it is served with a thin gravy or sauce and is not served on or with any sort of bun. 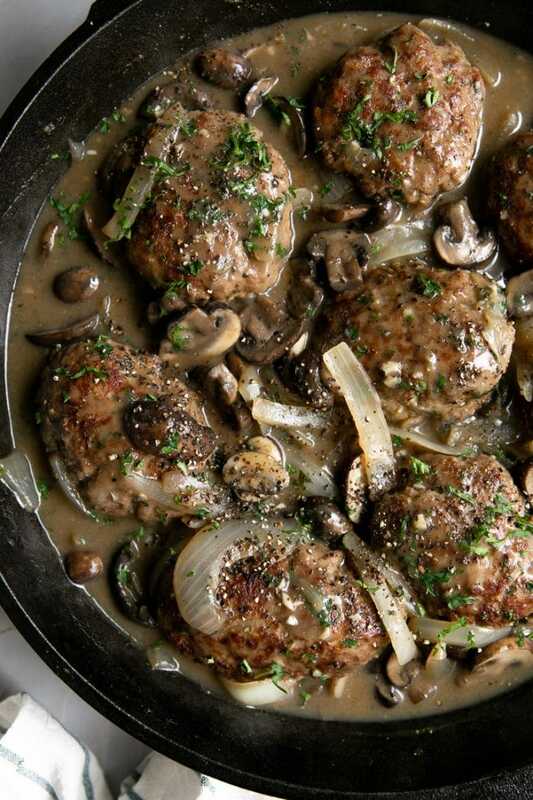 Salisbury steak– can contain as little as 65% meat and 25% of it can be pork. 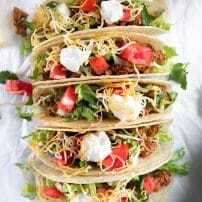 Usually, it will contain binders such as breadcrumbs or vegetables such as onions, mushrooms, or bell peppers. Unlike the Hamburger steak, a Salisbury steak is somewhat misshaped, more oval than round, and is served with sides such as mashed potatoes, pasta, and gravy. Some of you may be wondering if the mushrooms are a must-have ingredient. Truthfully, no. You do not have to add the mushrooms. However, the mushrooms play a big part in adding an extra layer of flavor to the gravy which will be lost if the mushrooms are left out. If you’re not a huge fan of mushrooms but don’t mind picking them out, I suggest cutting the recommended amount in half. 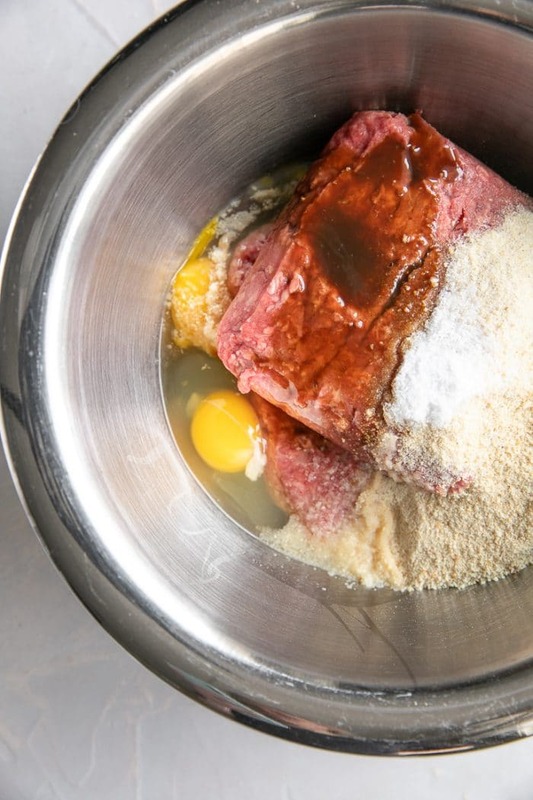 Before starting the gravy, you want to mix together the ground beef, breadcrumbs, eggs, Worcestershire sauce, onion and garlic powder, salt, mustard powder, and black pepper in a large mixing bowl. Use your hands to shape the beef mixture into oval(ish) shaped patties (unlike hamburger patties, these don’t have to be perfect). This will be enough to make 6 very large patties or 8 regular sized Salisbury steak patties. Heat the oil (or butter) in a large skillet over medium-high heat. Add as many patties as will fit comfortably and cook for approximately 1-2 minutes per side, or until golden brown. Remove to a clean plate and repeat with any remaining patties. Return the skillet to medium heat. Add 1 tablespoon butter and onions, and cook, stirring often, until the onions have softened and start to turn golden. Add the mushrooms and continue to cook for an additional 3-4 minutes before adding the garlic. Mix well and cook for 1 minute. Stir in the remaining butter and sprinkle the onions and mushrooms with flour. Stir continuously to remove any lumps. Slowly add the broth, stirring continuously, and removing any lumps that may form. Bring to a simmer and add the Worcestershire sauce, salt, and pepper, to taste. Reduce heat to low, cover, and simmer for approximately 10 minutes, or until the gravy starts to thicken. Stir often. Remove cover, tuck the Salisbury steak patties back into the gravy and continue to cook for an additional 5-10 minutes, or until heated through. Season to taste. Growing up my family always served this recipe with a side of creamy mashed potatoes and buttered peas, corn, or carrots. In my family, that was our go-to combination whenever we were eating something like beef or baked chicken for dinner. But that doesn’t mean you have to enjoy your Salisbury steak with these things! Other delicious recommendations to help you sop up that mouthwatering mushroom gravy include rice, butter noodles, or other favorite grain such as quinoa and barley. 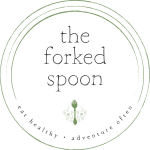 I also love to serve this yummy family meal with green beans or roasted cauliflower. Is Salisbury Steak good leftover? As you may imagine, my family of three had quite a bit of leftover Salisbury steak. 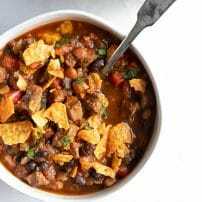 Fortunately, this recipe tastes fantastic warmed up for lunch or dinner up to 2-3 days after it is prepared. Personally, I love having leftovers as it makes the rest of the week a complete breeze. To store, add the Salisbury steak patties and gravy to a large container with a tight-fitting lid and keep stored in the refrigerator until ready to eat. Serve with leftover mashed potatoes or another favorite side of your choice. *TIP* If you prefer not to cook all 8 patties at the same time, you may freeze any extras for later use. The easiest way to do this? Form all patties and place them on a baking sheet lined with parchment paper. Cook as many as you would like and freeze the remaining Salisbury steak patties by transferring the baking sheet directly to the freezer. Once the patties are frozen, transfer them to a freezer-safe ziplock bag and store in the freezer for up to 6 months. 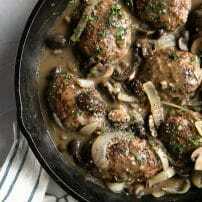 If you try making this Skillet Salisbury Steak Recipe, please leave me a comment and let me know! I always love to hear your thoughts. 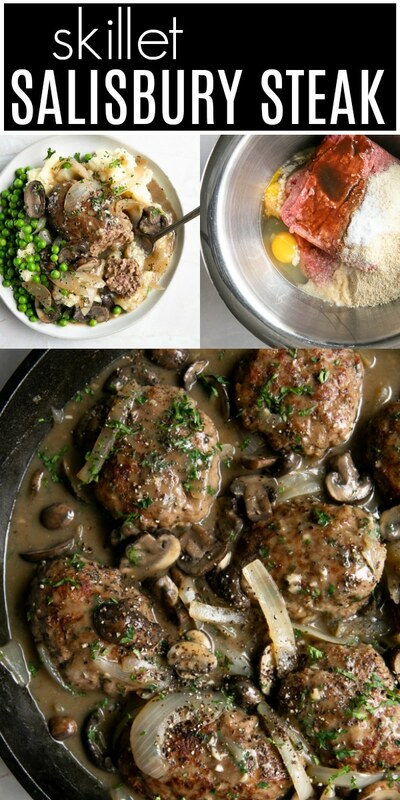 DON’T FORGET TO PIN AND SHARE THIS EASY SALISBURY STEAK AND ADD IT TO YOUR NEXT WEEKLY MEAL PLAN! 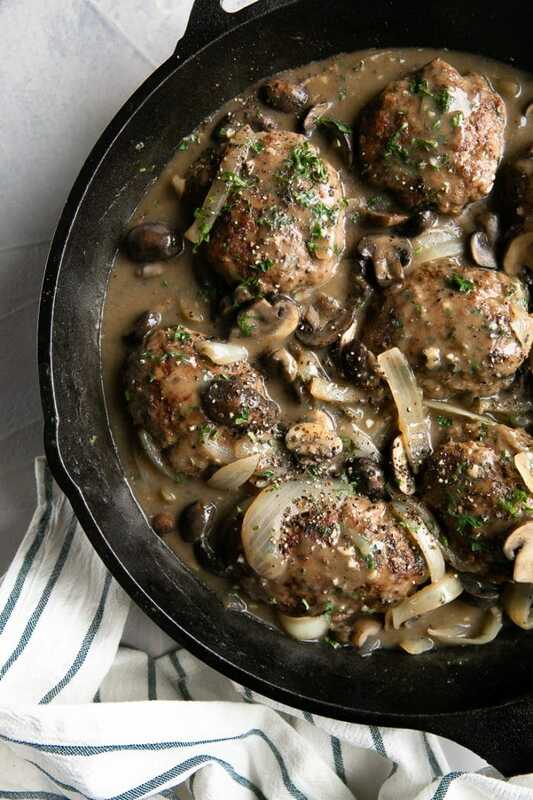 Made with tender, juicy beef patties smothered in a homemade onion and mushroom gravy sauce, Salisbury Steak is a classic comfort meal loved by all ages. 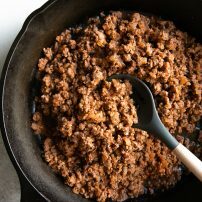 In a large mixing bowl combine the ground beef, breadcrumbs, eggs, Worcestershire sauce, onion powder, garlic powder, salt, mustard powder, and black pepper. Mix well to combine and shape into 6-8 equal sized oval-shaped patties. Heat a large skillet over medium-high heat. Add the oil and swirl to coat the entire surface of the skillet. Add the patties (you may not be able to cook all the patties at one time- work in batches as needed) and cook until browned and sides are crispy. Flip the patties and cook on the other side (approximately 1-2 minutes each side). Remove from the skillet and set aside to a clean plate. Repeat with any additional patties as needed. As soon as the Salisbury steak patties have finished browning, return the skillet to medium heat. Melt 1 tablespoon of butter and add the onions. Cook the onions, stirring frequently, until they are soft and golden. Stir in the mushrooms and cook for an additional 4-5 minutes, stirring often. Add the garlic and cook for 1 minute more. Stir in the remaining 2 tablespoons of butter and sprinkle the onions and mushrooms with the all-purpose flour. Stir continuously to remove any lumps. Slowly stir in the broth, whisking continuously to remove any lumps that may have formed. Add the Worcestershire sauce and season with salt and pepper, to taste. Reduce heat to medium and simmer until the gravy starts to thicken (approximately 10 minutes). Stir often. Tuck the Salisbury steak patties back into the gravy and cook until the patties are cooked to desired doneness (approximately 5-10 minutes), gently stirring the gravy around the patties every few minutes. Season with additional salt and pepper, to taste. Serve patties topped mushroom sauce. Enjoy! 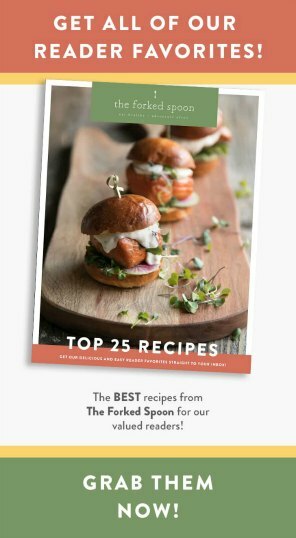 This recipe makes 8 Salisbury steak patties for a total of 8 generous servings. Should you decide to cut the recipe in half, you may cut the entire recipe in half or just the total amount of Salisbury steak (4 patties rather than 8) and keep the extra gravy (highly recommended). I used this 13.25 inch Lodge Cast Iron Skillet.